Everyone’s talking organic and local. Eating organic is obviously a lot better for you, given the lack of chemicals used in growing the food. But is it always the best choice for the planet? And where do you go to find it? Organic produce is important. We have spent a great deal of the 20th century adding synthetic chemicals to our food supply and the organic movement is a return to the kind of farming that was ‘conventional’ before all this tampering with our food began. In a nutshell, organic means: farming that replenishes the fertility of the soil, without the use of chemical pesticides, herbicides and insecticides; livestock are reared without the routine use of antibiotics and growth hormones, and organic produce may not be genetically modified. It is a highly regulated industry overseas (in South Africa not as much so), and one way to know for sure that what you buy is organic, is to look for certification. Processed organic food usually contains only organic ingredients, or if non-organic ingredients are present, they are only a certain percentage of the food (95% in the US and Australia, according to Wiki). Organic food is a healthier option to food grown with the use of chemicals. However, when we start importing organic products then the cost to the planet suddenly becomes a lot higher. Food miles are the distance your food travels from plough to plate, in other words, from the farm to your plate. Effectively, the further your food travels, the more CO2 emissions, the higher the cost to the planet. So, importing organic sugar from USA or avocados from Spain is costing the earth a lot more than avos produced on a farm in KwaZulu Natal. Better still, if they’re grown by a farmer local to you, they’re costing the earth even less. 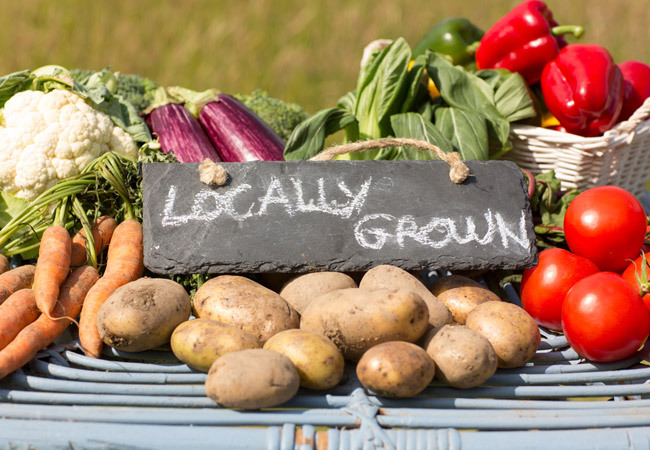 There is obviously a huge push then, to eat local – the closer to your home, the better. However, before we throw the bathwater out with the baby, there is another factor to consider. The theory that local is automatically better than imported organic produce doesn’t always hold water. Locally produced beans that are grown using a lot of fertilisers and tractors are anything but carbon-friendly. By comparison, beans grown in Kenya, for instance, are produced in a highly environmentally-friendly way (nothing is mechanised), they use low-tech irrigation systems, and, most importantly, they provide employment to many in the developing world. Weigh that up against the air miles used to get them to the supermarket. So, it isn’t as simple as buying local over organic every time! For me, first prize is local and organic, and preferably with minimal packaging, if any. 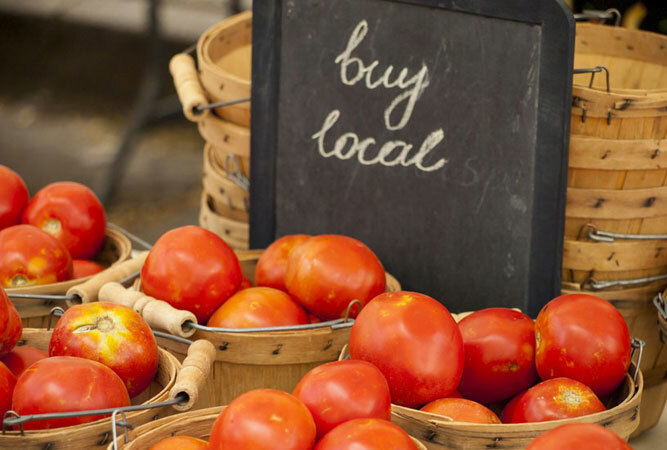 The idea is to buy locally produced food, or any goods and services actually, as close to your home as possible. So where can you buy organic? A good place to start, if you want to support both organic and local food, is organic box delivery schemes. There are now a number of these in Cape Town, and you are rather spoilt for choice. Shop around until you find one that suits you and your pocket. The Ethical co-op has an excellent online facility and delivers to your door, Ganics, which now has a sister shop in Obz called Quensch, Wild Trading store in Woodstock that also has a Saturday morning market and on Fridays serves a lunch of local, organic and seasonal fare at their trading store, whilst you stock up on goodies. Harvest of Hope offers a variety of vegetables grown in the townships enabling the poor to help themselves, Organic zone in Muizenberg offer two standard box sizes (which sometimes makes the decision a lot easier), Zetler Pharmacy in the city bowl, and Christiana’s whole food. 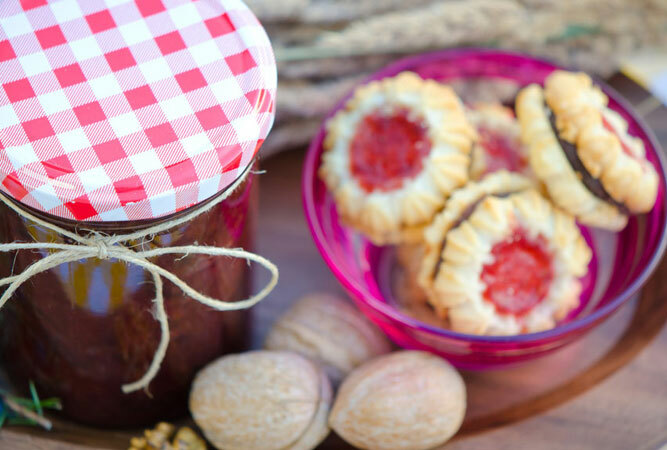 Capetonians are thoroughly spoilt when it comes to markets where you can buy organic and local products from the source themselves. The Rondebosch organic Market and the Neighbourgoods Market – both on a Saturday morning are both excellent. The Neighbourgoods Market is an experience on its own and is a great source of organic and locally produced foods. The Porter Estate Produce Market, also on a Saturday, at the Chrysalis Academy behind Tokai forest picnic area, is a feast of food and wonderfully child-friendly, and the new Earthfair Market in Tokai, near Builders Warehouse, not only trades on Saturday mornings, but also on Wednesday evenings from 14h00 until 20h00, and encourages patrons to bring their own packaging. This already long list doesn’t mention staples like Imhoff farm which has a market on the first Saturday of every month, the Obz night market every Thursday from 4pm, the Nitida Farmers’ Market in Durbanville, the Joy Market, a community market in the city bowl, and Mielie’s organic market at Montebello every Friday from 9am. Then there are the equally excellent markets a little further afield – the Stellenbosch Organic Farmers’ market, the Franschhoek Farmers’ Market, the two slow food markets – one at Willowbridge, and the Stellenbsoch Fresh Goods Market now moved to Oude Libertas, and the Camphill village market on the 1st Sunday of every month. There are very few restaurants calling themselves organic. It is still a tricky promise to make – to be completely organic – as suppliers are like hens’ teeth and supply is inconsistent. More and more restaurants now promise to use local fresh produce as much as possible in a bid to meet the demand made by those wanting to eat in a more earth-friendly way. But challenge their claims, and make sure they really are doing so. Only Sage Organic Cafe in the city bowl and kwaLapa at Montebello in Newlands actually call themselves organic. Sage Organic Cafe, in Gardens, uses organic wherever possible and menu orders are SLOW FOOD made with love! New kid on the block, kwaLapa at Montebello, has an amazing menu of organic and local fare and is set in amongst the trees in a wonderfully relaxing setting. Bird’s Boutique Café in Bree Street is a trendy eatery that serves organic on the menu, baked-by-hand goodies, and also has an organic box delivery scheme. They’ll also do catering too, if you’re prepared to entertain a wacky handwritten quote and fairly steep prices, but then it is organic and homemade. La Cuccina in Hout Bay use organic ingredients wherever possible, the Picnic Basket in Fish Hoek sells organic vegetables and fruit and uses these in their menu, Green Beans Café in Westlake makes a to-die-for wheat-free carrot cake with organic carrot and spelt flour, and Woolworths’ in-store café has organic sugar on the table and offers organic coffee and other organic goodies on the menu. Other great restaurants include: Ashtons @ Greenways in Upper Claremont where breakfasts are hard to beat, The Greenhouse, at Cellars-Hohenort Hotel in Constantia, and The Quaffery in Wynberg, which serves 100% organic coffee. 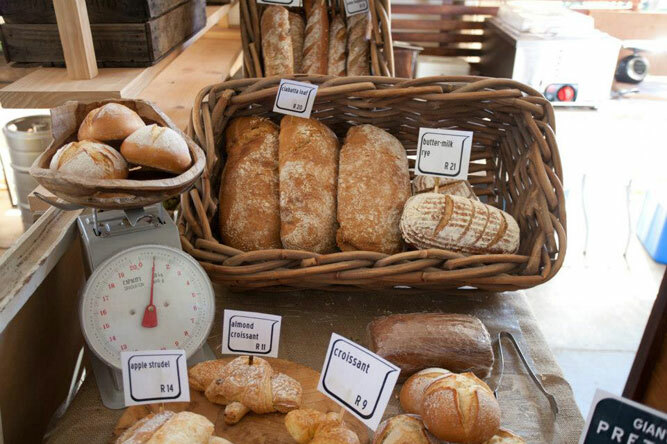 Some of the shops where you can buy fresh organic produce in Cape Town include: Creeds in Tokai, Farmstall in the City at Starke Ayres Garden Centre at Liesbeek Parkway, Millstone Farmstall and cafe at Oude Molen Eco Village in Pinelands (a great child-friendly venue), Organic Living in Constantia Village, Organics Alive and Wellbeing Natural medicine in Muizenberg, and Organic Zone in Lakeside.